The game is a side-scrolling adventure game where you control the famous Warner Brothers cartoon character Bugs Bunny on a quest to get to his 50th birthday party. He is armed with a mallet that he can swing at various enemies to defeat them, deflect certain projectiles or destroy bricks. He can also collect hearts to restore his health and carrots for bonus points. At the end of each level, Bugs Bunny had to use his mallet to defeat a Warner Brothers cartoon character such as Foghorn Leghorn, Sylvester, or the Tasmanian Devil. Porky Pig is featured in the box art, but not in the game itself. These other Looney Tunes characters are trying to stop Bugs because they are all jealous that Bugs gets all the attention. 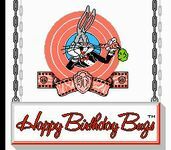 Source: Wikipedia, "The Bugs Bunny Birthday Blowout", available under the CC-BY-SA License.